It's been a while since Atlantis Productions last staged a play, and even though their next one was going to be a musical based on a computer-animated DreamWorks film I didn't quite like, off to Meralco Theater I still went with my friends yesterday. Under the direction of Bobby Garcia, the Broadway and West End hit Shrek The Musical was entertaining enough to hold my attention for two hours, owing mostly to its catchy music (by Jeanine Tesori), witty lyrics (by David Lindsay-Abaire) and amazing lead cast. Rycharde Everley stars as Shrek, with a spot-on Irish accent and a fantastic singing voice, while Shiela Valderrama-Martinez brilliantly plays neurotic and totally unconventional Princess Fiona. Nyoy Volante and Jett Pangan seem to have truly found their niche in theater, shining in their roles as the hilarious and fast-talking Donkey and Lord Farquaad, respectively. Carla Guevara-Laforteza, as per usual, does an impressive job singing and acting, this time as the sultry and love-sick Dragon, while Nel Gomez portrays Pinocchio. The musical's target audience seems to be children watching together with their families who are more into fun and less into details, but for a play whose Broadway production received accolades for set and costume designs, they could have improved on their stage decor and costumes. I understand budget might have been an issue and therefore needed to be concentrated more on certain sets and the lead characters' costumes. It still bothers me, though, that (1) they chose for Shrek's breeches (seen in photo above) a pattern that doesn't resemble anything a swamp-dwelling ogre could find in his habitat and turn into fabric (they could have just settled for solid black or dark brown), (2) the rabbit character's lower body fur was coarse, reminiscent of a microfiber chenille mop (the three blind mice's fur looked more appropriate as bunny hair), (3) Humpty Dumpty had brick-pattern legs like the wall he had been sitting on in the nursery rhyme had actually become part of his body, and (4) Dragon's prisoners, for the sake of choreography, could actually free themselves of their stocks (not a costume issue, but still worth mentioning). Good thing they had a really, really well-made Dragon that more than compensated for everything. Whether or not they had intended for the men manipulating the puppet to be seen, I do not know, but if they didn't, better lighting manipulation from directly above the dragon could have rendered the animators a lot less visible. 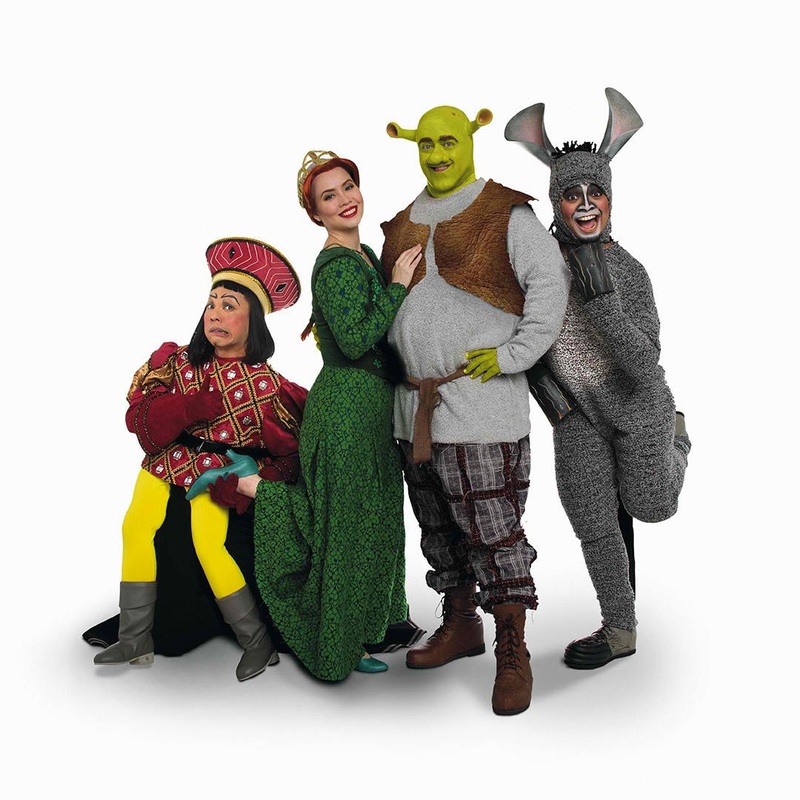 All in all, Shrek The Musical is a great play to catch with family and friends. See it for the three Princess Fionas' "I Know It's Today" number, Dragon's musical performances, and all scenes with Donkey and Lord Farquaad in them. At the very least, the musical's a great source of inspiration if you're looking to dress up this Halloween. 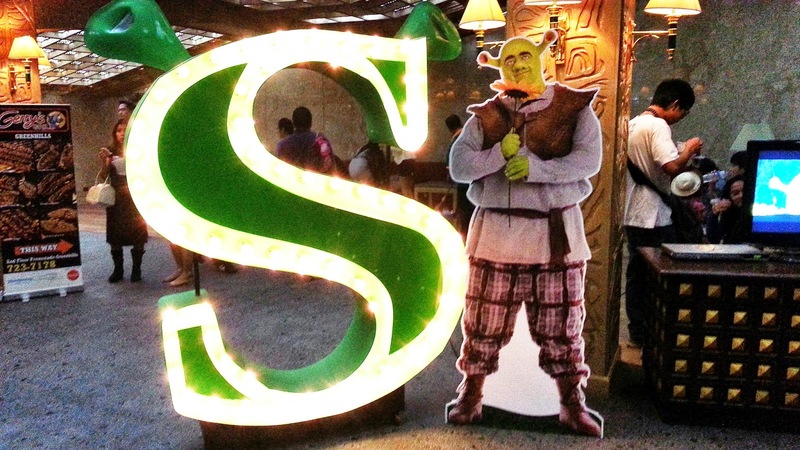 Atlantis Productions' Shrek The Musical started its four-week run on September 19 and will have its last show tomorrow, October 12. Tickets are on sale through Ticketworld.